This article evaluates Cuban economic performance in 2004–2005, contrasting it with 2003 and 1989 (prior to the crisis); in addition, it compares 2004 targets with actual performance and examines targets and prospects for 2005. The analysis of economic performance includes macroeconomic, physical output and external sector indicators; social performance is the subject of another paper in this volume (Mesa- Lago and Pérez-López 2005b). The paper also summarizes the processes of economic recentralization and de-dollarization and highlights the most important findings. It is based mostly on Cuba’s official data from Oficina Nacional de Estadísticas (ONE),1 statistics and publications from the Economic Commission for Latin America and the Caribbean (ECLAC), as well as academic articles by Cuban scholars and newspaper articles mainly published in Cuba. Growth. GDP growth slowed down from 6.3% to 1.5% in 1999–2002 (see Table 1); the average annual growth rate in 1990–2000 was -1.2%, the lowest in the region (ECLAC 2000c).2 A book published by ECLAC attributes the slowdown to external factors, such as low world price of sugar and nickel, a drop in international tourism, and the damage inflicted by three hurricanes (ECLAC 2004b). I have argued elsewhere that the slowdown primarily resulted from the stagnation of economic reforms, a view shared by several Cuban economists, although adverse external factors worsened the situation (Mesa-Lago and Pérez-López 2005a; Pérez Villanueva 2005). ECLAC also contends that Cuba’s GDP growth during 1998–2002 exceeded the “flat” average growth rate for Latin America (1.3%) and therefore avoided a “lost six-year period” in the region’s economic growth (ECLAC 2004b: 44–48). Actually Cuba lost 14 years in economic growth in 1990–2002. The significant slowdown in economic growth created a serious problem for the leadership, who had halted the reform process. At the end of 2001, Minister of Economics and Planning Rodríguez (2002) argued that 2002 had been a year of low economic growth but high social development. Citing Castro, he strongly criticized the GDP methodology developed by the United Nations, used internationally for more than six decades and adopted by Cuba in the early 1990s, describing it as “an indicator, designed for a market economy, incapable of reflecting the social accomplishments, wealth distribution and social welfare of a given country [and imposed] as a standard criterion for development.” Such methodology, he said, “underestimates our results in comparison with other countries, due to the higher proportion of free and subsidized consumption in Cuba, hence, placing us in a notoriously unequal position.” He announced that “to solve some of those deficiencies we have worked to achieve both a more just international comparison and a proposal to measure services within GDP providing a more realistic vision of our society.” In 2003 Cuba released two growth rates: 2.6% based on the conventional GDP methodology and 3.8% taking into account the value of free social services and price subsidies to rationed consumer goods (Rodríguez 2003). In 2004 only the second estimate was released: 5%, but it was said that the “new method still reflects only part of the social services provided in our country [hence] these calculations will continue to improve, steadily raising their precision and quality” (Rodríguez 2004). ECLAC published a 3% growth rate, presumably based on the conventional methodology, and informed that “Cuba is advancing in the implementation of a new methodology intended to correct various distortions in the structure of relative prices in the calculation of GDP” (ECLAC 2005: 15). And yet such methodology is not the universally accepted one and Cuban GDP, based on it, is not comparable with GDP in the rest of the world. A second difficulty in evaluating Cuban economic growth over time emerges from the shift in the base year to estimate GDP at constant prices. From 1985 to 2000, GDP was based on 1981 prices, but in 2001 the base year was shifted to 1997. Table 1 presents GDP (absolute and per capita) in the old series (1981 prices) and the new series (1997 prices) for 1989– 2000, the period when both series are available; it also shows the estimates based on the new series for 2001–2004. The new series raises the absolute annual value of GDP in every year of the period by an average of 56.2%. This very significant increase has not been explained by Cuban authorities, ECLAC has not noted it, and it appears to be a statistical manipulation. Based on the old series, GDP absolute and per capita in 2000 were 15.5% and 20.2%, respectively, below the 1989 levels; but the new series estimates the gap at 10.8% and 15.8%, respectively, in 2000, about 4.5 points lower, and in 2004 the gap is reduced to 1.4% and 7.2%, respectively, another statistical miracle (Table 1). ECLAC’s estimated growth rate of 3% for 2004 is considerably below the regional average rate of 5.5% in that year (ECLAC 2004c). If the average overestimation of 56% observed in 1989–2000 (resulting from the shift in base prices from 1981 to 1997) were applied to the 3% rate in 2004 it would be reduced to 1.3%. That reduced rate seems to be confirmed by Cuba’s reported loss of $3 billion in 2004 (8.8% of GDP) for three reasons: two devastating hurricanes ($2 billion), the worst draught of the century (at least $800 million), and a severe electricity crisis ($200 million) (Rodríguez 2004). 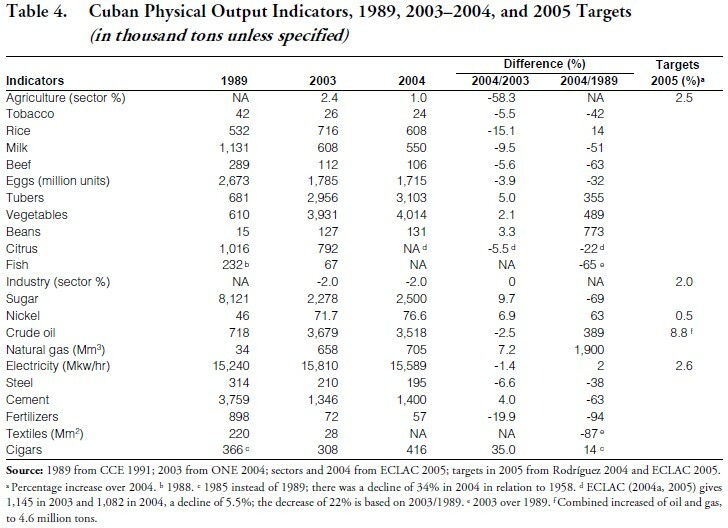 The analysis of physical output (see below) also questions the 1.3% estimated growth rate in 2004. 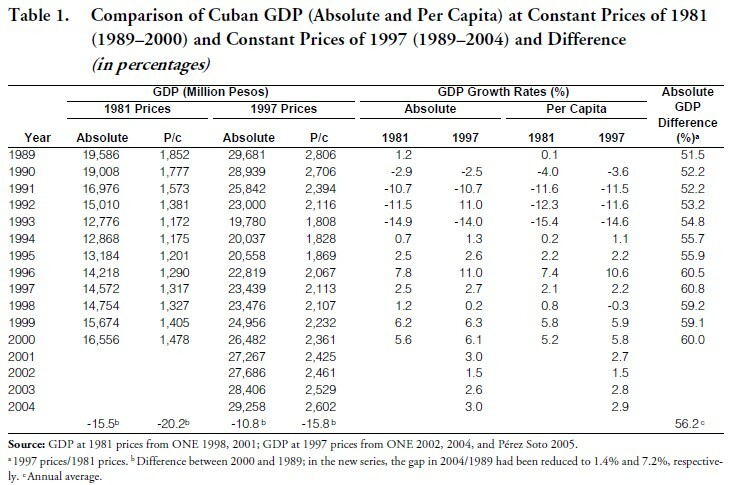 The GDP growth rate target in 2005 was set at 5%, the same as was achieved in 2004 based on the Cuban methodology. In July 2005, Castro released an estimate of GDP growth of 7.2% in the first half of 2005, projected to 9% for the entire year (Castro 2005a). ECLAC (2005), in turn has reported a 6% growth rate for the same period, reducing the 2 percentage- point gap between the two GDP growth rates in 2004 to only 1.2 points. A Cuban economist has contested the 2005 growth estimate, arguing that the first half of the year is the most dynamic because of the sugar, tobacco, and citrus harvests, as well as the peak tourist season, while the second half is slack as it includes the vacation period, no significant harvests, and the slow tourist season (Espinosa 2005a). The overvaluations explained in this section make Cuba’s GDP new series virtually worthless; one wonders if ECLAC would eventually accept such faulty figures. Capital Formation and Domestic Investment. 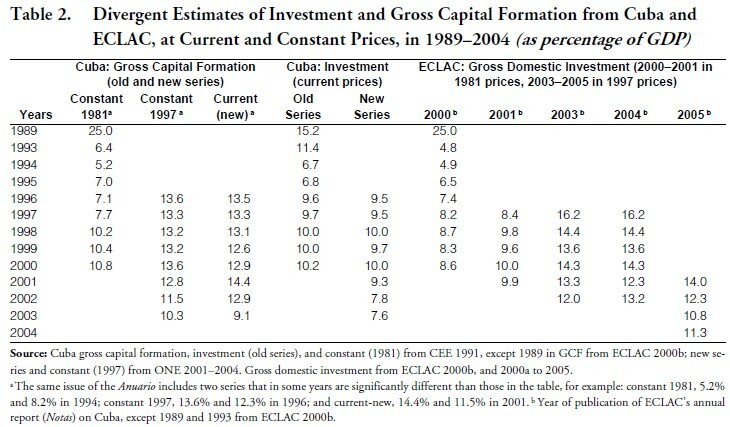 It is virtually impossible to make a serious assessment of trends in gross capital formation and domestic investment as percentage of GDP in 1989–2004, due to the multiple series with significant contradictions published by Cuba and ECLAC, compounded by the change in the base year for GDP in constant prices from 1981 to 1997 (see Table 2). For instance, Cuba’s gross capital formation at 1981 and 1997 prices varied 6.5 points in 1996, and while the series in 1981 prices exhibited an increasing trend in 1994–2000 (there are no data for 1990–93, when it was declining), the series at 1997 prices shows a declining trend, particularly in 2000–2003. Surprisingly, Cuba’s investment at current prices in the old series (system of material product) and new series (system of national accounts) is fairly similar in 1996–2000, and both exhibit declining trends. ECLAC’s series on gross domestic investment also shows considerable differences, e.g., at 1981 prices, 8.6% and 10% in 2000; at 1997 prices, 12% and 13.2% in 2002. The gap between the figures at prices of 1981 and of 1997 is even larger: 8.4% and 16.2% in 1997, and 9.9% and 14% in 2001. The only series that can be examined over the entire period 1989–2003 is investment, which is fairly consistent, and shows a decline from 15.2% to 7.6% of GDP; Cuba’s gross capital formation in constant 1981 prices dropped from 25% to 10.8% in 1989– 2000, in constant 1997 prices decreased from 13.6% to 10.3% in 1996–2003, and in current prices fell from 13.5% to 9.1% in 1996–2003; the latter figure was about half the regional average of 18.4% in 2003. ECLAC’s gross domestic investment at 1981 prices shrank from 12% to 8.6% in 1989–2000, and at 1997 prices declined from 16.2% to 11.3% in 1997–2004. The target for investment in 2005 has not been released, but all the above trends suggest that it will wane. Some Cuban economists have warned that investment has been insufficient to play the key role required for sustained growth and that a strong economic recovery would require an investment rate of 25% of GDP as in 1989; they also acknowledge that to increase investment, it is necessary for GDP to expand at a faster rate, instead of changing the investment/consumption ratio, because consumption cannot be further reduced (see Mesa-Lago and Pérez-López 2005a). The fiscal deficit as a percentage of GDP was stagnant at 2.4% in 1998–2001, but rose to 3.3% in 2003, and 4.2% in 2004 versus a target of 3.5% (Table 3). Both were higher than regional averages of 2.8% in 2003 and 2.2% in 2004 (ECLAC 2004b, 2004c). The fiscal deficit in 2004 was 6 times higher than in 1989, and ECLAC (2005) predicted an increase in 2005. The major reason for the growing deficit in 2004 was the expansion of expenditures by 12.4%, a faster rate than income growth; growth rates in education and housing expenditures were lower than in 2003, while those in administration, defense and internal order, pensions, and subsidies to enterprises and agricultural cooperatives (UBPC) were higher, with subsidies to the latter jumping by 107% (ECLAC 2005). ECLAC has argued that subsidies to cover losses by state enterprises fell since 1994, reaching 1.3% of GDP in 2001, although they rose to 1.6% in 2002 (ECLAC 2004b: 39), and yet that organization’s most recent publication (ECLAC 2005) shows that such subsidies actually rose to 2.8% of GDP in 2002 and 3.6% in 2004. The very high expenditures on defense and internal order (4% of GDP, the second highest percentage in the region; UNDP 2004) are attributed by ECLAC (2004b: 45) to the conflict with the United States, ignoring other factors such as the significant expansion of the police force and the very costly privileged special pension scheme of the armed forces. 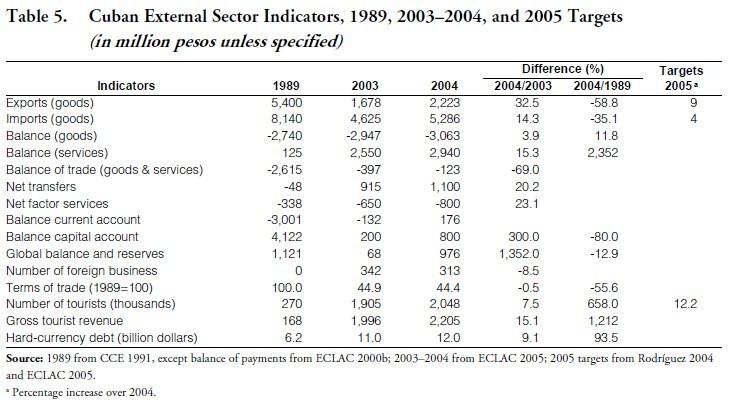 The Cuban government has not set a fiscal balance target for 2005, but ECLAC (2005: 14) projects a “significant increase in the fiscal gap that will expand monetary liquidity.” Contributing to the higher fiscal deficit in 2005 are recently-announced increases in minimum wages, salaries of education and health personnel, and pensions, estimated at 3.5 billion pesos or 10.5% of GDP in 2004 (Mayoral 2005a). Inflation. Based on the consumer price index (CPI), there was deflation in 2003 (-1%) and inflation of 3% in 2004, 6 times higher than in 1989 (Table 3), although still less than one-half the regional average of 7.7% (ECLAC 2004c). Inflation figures are questionable: Cuba has never published information on the basket of goods and services used for the calculation of the CPI and the latter has shown deflation in several years while the GDP deflator was rising. The rise of inflation in 2004 was due to three major factors: (1) rising budget expenditures (discussed in the previous section); (2) price increases in free agricultural markets: out of 12 products regularly sold in those markets, 9 saw raises in prices, with a nonweighted average increase of 6%; and (3) price increases in hard-currency shops (tiendas de recaudación de divisas, TRD) between 10% and 30%, with an average of 15%3 (ECLAC 2005). After being stagnant in absolute terms in 1995–1998 (declining as a percentage of GDP until 2000), monetary liquidity (M2) has been rising since 2001, and reached a record 14.6 billion pesos (an increase of 7.8%) in 2004, tantamount to 43% of GDP, the highest since 1994 and twice the level of 1989 (Table 3). Money in circulation escalated by 9% in 2004 and doubled the 1989 level. Growing inflation, monetary liquidity and money in circulation are predicted for 2005, because of the increases in wages and pensions, as well as in prices in free agricultural markets and TRD (due to the 10% charged on exchange of the dollar and the 8% “appreciation” of the peso, see below). The performance in terms of physical output of key products in the Cuban economy (principal exports, energy, food, and manufactures) is presented in Table 4. Out of 17 key products for which data are available for 2004, 9 decreased their output. Except for oil, gas, nickel, and cigars, production was lower in 2004 than in 1989. Industrial Sector. Industrial sector output decreased by 2% both in 2003 and 2004 (the 2004 target called for an increase of 2.5%), mainly due to the dismantling of the sugar industry and the electricity crisis that forced the shut down of many enterprises. Total industrial output in 2003 was 48% below the 1989 level; out of 40 industrial lines, output in 34 of them was considerably lower in 2003 than in 1989 (ONE 2004). As result, industry’s share of GDP shrank from 27% in 1989 to 15.7% in 2004 (Mesa- Lago 2000; ECLAC 2005). Reportedly in the first half of 2005, 13 out of 22 industrial lines increased production (Castro 2005a), which means that output declined in 9 product lines, but probably in others as well since earlier statistics had referred to 40 product lines in total. The target for 2005 is for industry to grow by 2%, a very difficult task to accomplish in view of performance in the first half of the year: decreases in output of sugar and electricity, apparently stagnant oil/gas output, as well as a target for nickel that implies virtual stagnation (see below). Oil. Oil extraction peaked at one million tons in 1986, declined by 44% in 1987–1991, and expanded thereafter, reaching a record 3.6 million tons in 2003; output decreased by 2.5% in 2004 to 3.5 million tons, the latter almost five times the output level of 1989 and 3.5 times that of 1986 (CCE 1991; ONE 2000–2005; Table 4). This impressive jump in output has been the result of more than half billion dollars in foreign investment. Natural gas extraction jumped 20 times in 1989–2004 reaching 705 million cubic meters, but its contribution to national energy needs is small. The combined target of oil and gas output for 2004 was set at 4.6 million tons (Rodríguez 2003) and actual combined output was 4.2 million tons, so that the target was unfulfilled by 8%. Reportedly, the combined output of oil and gas in the first half of 2005 was 1.9 million tons (Castro 2005a); assuming that output for the entire year is evenly distributed, it would be 3.8 million tons, 10% lower that the combined output of 4.2 million tons in 2004, and 17% lower than the target of 4.6 million tons.4 One-half of Cuba’s total energy needs are met with domestic production, mainly from bagasse (in decline because of cutbacks in sugar production) and crude oil; the contribution of natural gas and hydroelectric power is minimal. The share of domestic output in total crude oil and derivative demand increased from 12% in 1989 to 41% in 2004; imports accounted for the remaining 69% of needs in 2004, out of which 44.4% was supplied by Venezuela and 15.6% by other countries (based on Mesa-Lago 2000; ONE 2003; ECLAC 2004, 2005). At the end of 2004 it was announced that the joint venture Sherritt-Pebeco had discovered new oil deposits in Santa Cruz, the crude was lighter and had lower sulfur content than existing deposits, and the deposit size was tentatively estimated at 14 million tons (Castro 2004). The size of that deposit is small compared to domestic demand, as it would supply only 18 months of Cuban needs and the oil would have to be mixed with lighter crude. The well went into experimental production that should allow more precise evaluation of volume and quality of oil; as of August 2005 no new information had been provided. Argentina’s Repsol YPF has signed an agreement with Norway and China to invest $60 million in explorations in the northern coast of the island (Sánchez 2005; for a thorough study of the energy situation see Piñón 2004). Nickel. With an investment of $350 million from Canadian company Sherritt, nickel output reached a historical record of 76,529 tons in 2001, but declined to 71,700 in 2003; it rose to 76,647 in 2004, 63% above the 1989 level, but barely above the 2001 level and below the target of 76,800 tons (Table 4; target from Rodríguez 2003). The three existing nickel plants are working at full capacity and new investment is required to expand output; furthermore, the newest plant, “Che Guevara” (Soviet-technology, located in Punta Gorda), consumes 18 tons of oil per each ton of nickel produced, compared to 12 tons per ton in the most efficient plant (U.S.-built “Pedro Sotto” in Moa). China has committed $500 million to complete the Las Camariocas plant, left unfinished by the USSR, which would produce 22,500 tons per annum; also an energy-intensive user, that plant was only financially viable when the Soviets subsidized the price of oil imports and bought nickel at high prices. At current record-high world market oil prices, the plant is not profitable. However, Venezuela has promised to supply coal for that plant (probably at subsidized prices). Still, the Chinese would probably have to pay above the world market price for Cuban nickel. Sherritt is investing $450 million to expand capacity in the “Pedro Sotto” plant by 16,000 tons per annum (initially a $1 billion investment and output of 50,000 tons were announced; Castro 2004). Studies are being conducted with China for an investment of $1.3 billion to exploit a nickel deposit in San Felipe that would produce 50,000 tons yearly. If and when all three investments materialize, output could increase by 88,500 tons, more than doubling existing capacity, but output will continue stagnant in the short run (Mesa-Lago 2005). The target for 2005 is to increase output to “close to 77,000 tons,” only 0.5% above the 2003 level, a feasible target (Rodríguez 2004). ECLAC (2005), however, gives both 77,000 tons and a 7% increase as targets, apparently confusing the actual increase in 2004 (7%) with the target in 2005. Sugar. Sugar harvests in 1993–2004 averaged 3.6 million tons yearly, half the average of the crops of the 1980s. Output declined from 3.5 million tons in 2002 to 2.3 million in 2003, albeit it rose slightly to 2.5 tons in 2004. Data on both the agricultural and industrial yields are no longer published; the latest available showed a drastic fall in the yield per hectare from 60.0 to 33.3 in 1989–2002, and in the industrial yield from 12% to 10.4% in 1985–2002 (ONE 2003, 2004). Numerous internal problems afflicted the industry, such as high costs, low efficiency and profitability, technological backwardness, and improper incentives, coupled with low international prices. After the 2002 harvest ended, 45% of the sugar mills were shut down, 60% of sugarcane land was shifted to other crops, and more than 100,000 sugar workers were dismissed. These changes were expected to cut costs, increase productivity, and generate a profit. The target for 2004 was set at 2.6 million tons and 2.5 million tons were produced, 9.7% higher that the preceding harvest, but 3% below the target. The 2005 sugar harvest started late and was plagued by a severe draught; only 70% of the mills operated and were afflicted by frequent breakdowns. Output reportedly dropped to 1.3 million tons (1.5 million tons according to ECLAC 2005), down 52% from 2004, and the lowest crop since 1908 when population was 18% of today’s. Obviously, the sugar industry strategy is not working, and Castro declared: “Sugar belongs to slavery times and will never come back to this country.” With a domestic demand of 700,000 tons (and therefore only 800,000 tons available for exports), Cuba is importing sugar from Colombia (Espinosa 2005b; Mesa-Lago 2005). Prospects for the 2006 harvest are even gloomier: the lingering draught, at least until May 2005, has resulted in short and thin sugarcane, weeds have invaded the fields and little cleaning is being done, lower yields are predicted, 40 more mills will not operate (leaving in operation only 45 mills, 29% of the total number in 2002) and many mills are not being repaired, and new cutbacks in the labor force have been announced (Frank 2005b). Key Manufactures and Electricity. Five manufactured products shown in Table 4 played a key role in Cuba’s industrialization process before the crisis, serving mainly domestic consumption and to a lesser extent exports. During the special period, there has been a process of industrial decapitalization, lagging technology, declining production, and high dependency of manufacturing on imported raw materials and fuel (Pérez Villanueva 2005). In 2004 electricity output decreased by 1.4%, steel by 6.6%, and fertilizers by 20%; data were not available for textiles, but it had previously shown a decreasing trend; cement output rose by 4%, after diving in 1999–2003. In relation to the 1989 level, output in 2004 of four of these products had shrunk between 38% and 94%; output of electricity was up by 2% but the population grew by 7% in that period. In 2004 output of cigars, a traditional export product, sharply increased by 35%, 14% above the 1989 level, but still 34% below the level of 1958. In the first half of 2005, electricity output decreased by 4% in relation to the same period in 2003 (Castro 2005a), making it impossible to meet the 2.6% growth target in the year. The cause was a series of breakdowns in major thermoelectric plants, including the “Antonio Guiteras” plant (for a second consecutive year), and plants at Nuevitas and Felton (Holguín); repairs were also required in two plants in Cienfuegos and insufficiency was reported in two plants in Havana. In June 2005 the national electricity system (SEN) was working at half capacity and blackouts lasted from 7 to 12 hours daily, prompting protests from the population in several towns (two of these protests were publicly acknowledged by Castro 2005a). Instead of blackouts, Cubans jokingly refer to periods when electricity was available as “light ins” (alumbrones). Most of the existing thermoelectric plants are 25–35 years old, it is extremely difficult to get spare parts (most plants were built in the socialist camp and parts are not manufactured any more and have to be made by special order), the domestic crude used in the plants is heavy with high sulfur content that requires frequent maintenance, many electric poles are rotten, 1.9 million breakers must be replaced, and distribution leaks are estimated to waste 17–18% of electricity generated. Compounding these problems, in July 2005, Hurricane Dennis knocked down 1,025 electric poles and 36 high tension towers (Castro 2005b; Espinosa 2005c; Murray 2005; Tang 2005). In a televised round table in July, Minister of Basic Industry Yadira García promised that the blackouts would soon improve “provided that no new breakages occur.” Probably to cover herself (the previous minister was fired by Castro allegedly because he did not inform the Commander in Chief of problems in the electric system) she declared: “Solutions of strategic nature have being personally conceived by Fidel and his opportune intervention and support have been decisive to cope with the problems” (Mayoral 2005b). Agricultural Sector. Agricultural sector output rose by 2.4% in 2003 but slowed down to 1% in 2004 versus a target of 3.7% (Table 4; Rodríguez 2003). The 1% growth rate is questionable, because out of 9 key agricultural products, production decreased in 6 as follows: 15% in rice, 9.5% in milk, 5.5% in tobacco and beef, and 3.9% in eggs. Such declines could not be surmounted by small output increases in three products: 5% for tubers, 2% for vegetables, and 3.3% for beans. In 2004 output was below the 1989 level in the following key staples: -63% for beef, -51% for milk, -42% for tobacco, -32% for eggs, and -22% for citrus. Concerning the latter, Cuba’s officially reported total output in 2003 was 792,700 tons (ONE 2004). However, ECLAC (2005) gave a figure of 1,145,000 tons (44% higher than Cuba’s) by adding an “estimate of production in backyards, urban gardens and self consumption in cooperatives and private farms.” Output of tubers, vegetables, and beans in 2004 was from 4 to 8 times the 1989 level. The number of cattle heads peaked at 6.8 million in 1967 and steadily declined by 42% to 3.95 million heads in 2004; the decrease in heads per capita was from 0.83 to 0.35 (Mesa-Lago 2000; ONE 2004; ECLAC 2005); the decimation of the cattle herd led to a drastic fall in beef and milk production. The target is for the agricultural sector to grow by 2.5% in 2005; except for sugar (down 48%), data on performance in the first half of 2005 have not been provided for most products in the agricultural sector (Castro 2005a), a silence that combined with the damage inflicted by hurricane Dennis suggests that the sector’s target will not be met. Causes for the decrease in agricultural output have been: (1) the lack of fodder for poultry and cattle that affected meat and diary products (imports of these products dropped 52% in 1989–2000, but increased in 2002–2004 with the surge of imports from the U.S.); (2) four hurricanes in 2001–2005 (Michelle, Isidore, Lili, and Dennis) that caused severe losses, particularly in citrus and tobacco plantations, as well as poultry farms; (3) the severe draught in 2004– 2005 that inflicted close to one billion pesos in losses; and (4) last but not least, the widespread inefficiency and lack of incentives in agriculture. UBPCs are very large and the government directs production and buys virtually all of their output at prices set below the market price, and their sales to free agricultural markets have a price ceiling, hence, creating serious disincentives. In 2003, one decade after they were created, 40% of the UBPCs reported losses and required state subsidies; in the same year the UBPCs’ share of cultivated land was 46% but they only produced 4% of total tobacco output, 10% of vegetables, 20% of tubers, 25% of corn, 28% of beans and 30% of pork; the rest was produced by private farmers and traditional cooperatives (Mesa-Lago and Pérez-López 2005a). Fishing. The fishing industry confronted problems before the crisis; the catch peaked at 244,000 tons in 1986 and steadily declined to 67,000 tons in 2003, 65% below the 1989 level and 72% below the 1986 peak (no figures have been released for 2004). The industry is plagued by serious problems, among them high debt, lack of liquidity both in pesos and dollars, poor credibility among creditors, corruption (the minister was removed in 2001 under allegations of corruption), damage inflicted by hurricane Michelle, and the electricity crises of 2004–2005 that affected refrigeration of the catch (Mesa-Lago and Pérez-López 2005). Trade Balance. Cuban external sector indicators are shown in Table 5. The value of exports of goods was 2.2 billion pesos in 2004, an increase of 32.5% over 2003, and considerably above the target of 7.5%, but still 59% below the 1989 level. The value of imports of goods was 5.3 billion pesos in 2004, an increase of 14.3% over 2003 (the target was to reduce imports), but still 35% lower than the 1989 level; the recovery of imports, therefore, albeit incomplete, has been faster that that of exports. The jump in the value of exports was mainly due to the rising volume and prices of nickel; the increase in imports resulted from high prices of oil (22% of total import value) and food (20%). The merchandise trade deficit was 3 billion pesos in 2004, an increase of 4% over 2003 and 12% above the 1989 level. These results confirm the traditional weakness of Cuba’s external sector, which after 12 years of economic transformations has been unable to substantially change the pattern of merchandise trade. Furthermore, there is a major difference between 1989 and 2004: there are no longer automatic Soviet long-term loans to cover the deficit, at very low interest rates, and subject to forgiveness of repayment based on political considerations. Now Cuba has to resort to short-term loans from foreign banks and other financial institutions, which charge high interest, and demand repayment. It has been asserted that in the first half of 2005, exports expanded by 26.3%, resulting in “a modest positive trade balance, somewhat higher than the surplus obtained in 2004” (Castro 2005a). But the latter is false, as there was a 3 billion-peso deficit in 2004. Terms of Trade. In 1989–2004 the terms of trade deteriorated by 55.6%. In 2004, rising prices of imported oil and food were not offset by a rise of nickel prices, while prices of sugar continued to be relatively low, resulting in 0.5% deterioration in the terms of trade. In December 2004 and April 2005, Cuba signed new economic and trade agreements with Venezuela that provided an injection into the otherwise dismal economy: (1) Cuba now receives 98,000 barrels of oil daily from Venezuela (up from 53,000 barrels per day before); (2) the price of such oil trade is set at $27 per barrel, while world prices in August 2005 reached $67 a barrel, resulting in a subsidy of about $1 billion in 2005; and (3) Venezuela is now paying the salaries of tens of thousands of teachers, physicians, sport trainers, and other Cuban professionals working in that country that before were paid by the Cuban government. Moreover, Venezuela is transferring to Cuba hard currency from oil not delivered to the island and sold to third countries. Despite these beneficial terms, Cuba’s debt to Venezuela for oil deliveries since 2001 to mid-2005 is about $2.5 billion (see Mesa-Lago 2005). Trade Composition. The share of sugar in total export value steadily decreased from 73% to 31% in 1989–2002 and to 16.9% in 2003, due to the fall in sugar export volume and value (ECLAC 2005 does not provide disaggregated data on imports and exports in 2004). Cuba’s statistical yearbook omitted in 2003 disaggregated data on mineral, fuel, and lubricant exports, hence it is impossible to estimate the value of nickel exports alone although it is the major component; the aggregate value rose from 32.5% to 39.4% (ONE 2004), mostly as a result of an increase in nickel prices. Tobacco’s share rose from 10.1% to 12.9% in 2003–2004, while fish and sea food’s share shrank from 6.9% to 3.8% and that of citrus was stagnant at 0.5%. The shares of three non-traditional exports decreased in 2002–2003: medicines from 3.6% to 2.9%, iron/steel from 2.8% to 2.1%, and cement from 2.4% to 2% (ONE 2004). Meanwhile, ECLAC (2005: 2) asserts that there was “continuous growth of non-traditional exports such as biotechnology, pharmaceutical, and genetically engineered products,” and yet its own statistical appendix does not show the value of pharmaceutical exports in 2004 or of any biotechnology or genetically engineered exports in any year. Contrary to that assertion, a Cuban economist recently noted that at the beginning of the 1990s, Cuba bet on the biotechnology industry as an export leader, but the expectations have been reduced considerably in recent years (Monreal 2004:102). The bulk of Cuban exports (nickel, sugar, tobacco, fish, fruits) are traditional primary products, typical of underdeveloped countries, while only a tiny minority are manufactured or semi-manufactured products. Cuba continues to have excessive dependency on low-value-added activities, such as processing of natural resources, and stagnating exports with high value added and technological complexity. The composition of imports showed some important changes in 1989–2003: dependency on imported food rose from 13% to 20% (consistent with decreasing food self-sufficiency), and dependency on imported manufactures jumped from 14% to 24%. At the same time, the share of imported machinery/transportation equipment decreased from 31% to 22%, of chemicals from 10% to 9%, and of fuels from 32% to 22%, the latter because of de-industrialization and Venezuela’s supply at subsidized prices (CCE 1991; ONE 2004). The poor performance of the agricultural sector has contributed to budget and foreign trade deficits, required massive food imports, and hindered export growth and diversification. Cuba is today a net importer of food and, as domestic production of meat, milk, rice, and beans is insufficient to meet demand, these products must be imported and account for half the value of food imports (ECLAC 2004b). Trade Partners. After the collapse of the socialist camp, Cuba significantly diversified trade partners. In 2003 the shares of main partners in total trade were: Venezuela 14%, Spain 12%, China 9%, Canada 8%, Netherlands 7.5%, Italy 5.5%, USA 5% (due to the food imports), Mexico and France 3.7% each, and Russia 3%—a decline from 65% with the USSR in 1989 (ONE 2004). Not only has Venezuela become Cuba’s leading trade partner, but it is approaching the role of great subsidizer the USSR played in 1960–2000. As part of the already-mentioned trade and economic agreements signed with Cuba in 2004–2005, Venezuela has promised to: finance projects on agriculture, industry, energy, and infrastructure; supply the needed coal for the Camariocas nickel plant to be finished by China; join in an enterprise with Cuba and China to produce stainless steel; and build a thermoelectric plant in Mariel. China is probably going to become Cuba’s second trade partner with the agreements signed at the end of 2004: deferral for 10 years of obligations accrued by Cuba; credits for about $200 million to buy Chinese TV sets, textiles, medical materials, and spare parts; a $500-million investment in a joint enterprise with Cuba to finish the Camariocas nickel plant and negotiations to exploit the San Felipe nickel deposits. Cuba is the only country in Latin America and the Caribbean that has not reached full membership in the major regional commercial associations (CACM, NAFTA, MERCOSUR7) and has been excluded from the Free Trade Area of the Americas (FTAA) negotiations; Cuba has joined CARICOM, but trade with Caribbean member countries is minuscule. In 2000 Cuba entered the European Union’s Asian, Caribbean and Pacific group (ACP) and could become a member of the Cotonou Accord and receive aid from the EU $14 billion fund, but the lack of democracy and violation of human rights in the island (including the imprisonment of 75 dissidents in 2003) has so far impeded accession, although in 2005 the EU lifted political sanctions imposed on Cuba in 2003 (see Mesa-Lago 2005). External Debt. The hard-currency external debt doubled in 1989–2004, from $6 to $12 billion (mainly due to accumulation of unpaid interest), and increased 9% in 2004 (because of the depreciation of the dollar). Cuba has defaulted on payments to Japan (the major creditor), Belgium, Canada, Chile, Mexico, France, South Africa, Spain, and the United Kingdom (Mesa-Lago 2005). At the end of 2004, Cuba’s total external debt was estimated at $35.4 billion (38% in hard currency and 62% in non-convertible currency with former socialist countries), tantamount to $3,100 per capita, more than twice the average per capita debt in Latin America (ICCAS 2005; average per capita based on ECLAC 2003b). As a percentage of exports of goods and services, a measure often used by financial institutions and ECLAC to assess ability to repay, the hard-currency debt alone was equal to 225% of the value of exports of goods and services in 2003, 31% above the regional average of 172% (based on ECLAC 2003b, 2005). Foreign Investment. Cumulative foreign investment in 1990–2002 was officially reported as $2.5 billion, but was also given as $5.9 billion in 2002, the difference explainable because the second figure refers to committed investment and the first to actual disbursement. Cuban publications devote large amounts of space to report the number of associations with foreign companies and contracts, but only occasionally make public figures on cumulative foreign investment and no data have been released since 2002 (Mesa-Lago and Pérez-López 2005). Statistics on foreign direct investment (FDI) have been discontinued since 2001, when FDI shrank by 91% (from $448 in 2000 to $39 million pesos in 2001); the number of mixed enterprises with foreign investors decreased from 403 in 2002 to 313 in 2004, a drop of 22% in two years (ECLAC 2003b, Table 5). Since 2002, an average of one joint venture and two smaller cooperative production ventures with foreign investors have close every week; in 2005 several mixed enterprises, many European and some operating since the early 1990s, were shut down by the government without compensation, while others pulled out losing their capital investment; another 67 of these ventures were expected to be closed before the end of the year. Castro has criticized many of these businesses for overcharging on imports, usurious financing, and profit margins of up to 40%. An official in the Ministry of Foreign Investment and Economic Cooperation stated in May 2005 that eventually there might be only 50 joint ventures left, because the government does not want small and medium-sized joint ventures anymore, but only major investors in priority areas such as energy, mining, and tourism (Frank 2005a). Exchange Rate. At the end of 2004, the U.S. dollar ceased to be legal tender and only convertible pesos are accepted by all state entities (including TRD) that sell in hard currency; all those who need to exchange dollars to convertible pesos are charged a 10% fee, but this fee is not imposed on exchanges of Canadian dollars, Euros, British pounds, and Swiss francs. In March 2005 the value of the convertible peso was arbitrarily raised by 8%: one convertible peso is now exchanged into 24 common pesos (instead of 26), but is bought for 25 regular pesos (instead of 27); an extra one peso is charged as commission for the exchange by the Central Bank. In April 2005, the value of the convertible peso vis-à-vis the dollar and other hard currencies was increased by another 8%, leaving unchanged the peso/convertible peso rate. The value of the dollar versus the convertible peso has been reduced by 20% ($0.80), combining the 10% fee, the new exchange rate, and the commission (see Mesa-Lago 2005). Tourism. The number of tourists rose from 270,000 in 1989 to 1.8 million in 2000, stagnated in 2001, and declined in 2002 (due to 9/11); it rose to 1.9 million in 2003 and surpassed the 2–million level in 2004, 7 times the 1989 level. Gross revenue includes the cost of imported inputs which must be deducted to calculate the net revenue, occasionally given between 61% and 70% of gross revenue; the latter jumped from $168 million to $1.9 billion in 1989– 2000, but declined to $1.8 million in 2001–2002; it recovered to $1.9 million in 2003 and reached a record $2.2 billion in 2004, thirteen-times the 1989 level. Targets of 2 million tourists and $2.6 billion in revenue were originally set for 2002; the first target was finally met in 2004, but the second is still unfulfilled by 15%. The target for 2005 is to increase the number of tourist by 12.2%, to 2.3 million; data for the first half of 2005 suggest that the target will be met (Castro 2005a). ECLAC (2004b) acknowledges that the import component of tourism is high and the occupancy rate of tourism hotel rooms is low, indications of low capacity utilization of the tourism infrastructure. There are different estimates of the occupancy rate released by Cuba and ECLAC, and also between various publications of the latter: Cuba’s series gives the highest rates but diminishing from 76.1% to 61.8% in 1998–2003 (ONE 2004); one ECLAC series (2004a) shows a decline from 64% to 55% in the same period, but another series reproduces the higher Cuban rates in 1999–2002 (ECLAC 2005) but still decreasing from 74.2% to 58.5% in 2000–2004. There are contradictions also in the ECLAC series on daily average receipts per tourist (dollars per day): according to one series (ECLAC 2001, 2002, 2003a) receipts declined 20% in 1997–2002, from $187.90 to $150.70; another series (ECLAC 2004a, 2005) shows higher figures since 2001, as much as 12% higher, but still showing virtual stagnation in 1998–2003, from $174.30 to $175.00 (no data are available for 2004). Despite the dismal economic situation, encouraged by the beneficial agreements with Venezuela and China, Castro launched a process of recentralization of decision making in 2004–2005 that has reversed most advances made by the modest market-oriented reforms implemented in 1993–1996.8 Such retrogression involves the following measures: banning state enterprises from conducting transactions and from providing 87 services in hard currency; requesting such enterprises to get approval from Cuba’s Central Bank (BCC) for all hard currency imports and paying a tax of 1–2% on the value authorized; disbanding decentralized enterprises that were allowed to conduct foreign trade and retaking control of other enterprises by the Foreign Trade Ministry (the remaining 192 enterprises authorized to import were reduced to 89 in 2005); forcing all enterprises (including the Cuban share in mixed enterprises and joint ventures) to deposit all hard currency income in a single account at the BCC and requesting its permission for all transactions involving hard currency and convertible pesos, as well as permission to sign checks for more than 5,000 convertible pesos; obligating state enterprises to prepare weekly budgets in advance and submit them for BCC approval; taking control of previously decentralized tourist enterprises and imposing tight controls on all tourist personnel; and further reducing the small private sector by cancellation or suspension of permits for 40 self-employed activities, which has led to a significant decrease in the number of those workers. As in previous occasions, the recentralization measures have been officially justified to control corruption and lack of discipline, confront U.S threats to Cuba’s economy, correct inequalities, and restore revolutionary morale. The underlying reason, however, is probably Castro’s urge to secure a tight transition after his death to his brother Raúl and the Communist Party. Decentralization of economic decision making on the part of hundred of thousands of both state managers and those who run the tiny but dynamic private sector, involved a risk that many of them would eventually resist the continuation of totalitarian control. Once again, the regime’s stern quest for political survival has trounced economic logic and the welfare of the people. Castro’s previous experiments with centralization and movement away from the market consistently led to dreadful economic effects. The new measures are already creating serious problems, such as delays in receipt of needed imports, creditors who have been unable to collect payments, time taken from attending to tourists by hotel managers who must prepare detailed weekly bureaucratic budgets; and reduction in the number of active joint ventures and foreign direct investment. Another important reversal of the market-oriented reforms has been the banning of the dollar as legal tender and its substitution by the convertible peso; the 10% exchange fee for dollars, combined with the 8% increase in the value of the convertible peso, resulted in a raise in the rate of exchange from par to $1.20 per one convertible peso. De-dollarization measures are officially justified by the Cuban government to counteract U.S. pressures on foreign banks to impede Cuban dollar deposits made to fulfill international financial obligations, as well as a significant step toward making the peso fully convertible. The first argument is true, but it results from the Cuban government’s deposits of money-laundered funds that prompted a scandal involving Union de Banques Suisses (UBS), while the second justification (peso convertibility) is rejected by the following reasons: there are two pesos in circulation (regular and convertible), the rate of exchange of the convertible peso to the dollar continues to be arbitrarily set by the government (the peso is not traded in world markets), and other foreign currencies are circulating legally and can be used to make purchases at TRD. Actually, the principal cause of the de-dollarization is the Cuban government’s severe lack of liquidity, due to its enormous foreign debt and multiple defaults, which have created an urgent need to obtain hard currency. In the short run, the new measures have generated more dollars for the Cuban government but such measures will not solve the grave structural problems of the Cuban economy, such as the enormous deficit in its trade balance of goods, the scarce and costly access to foreign credit, and the chronic insufficiency of hard-currency. In the medium and long term, the Cuban government may experience some adverse effects from these policies, such as the resurrection of the black markets in goods and dollars, a reduction in foreign remittances, and a decline in Latin American tourism. These measures should further reduce personal consumption, and the people face the uncertainty of new restrictions in the future, such as a total ban on the possession of dollars. Despite the obvious recentralization process, ECLAC states that, as a result of the reforms, “Cuba has a centrally planned economy with decentralized market mechanisms” and, as decentralization has progressed, “the scope of the market widened.” Also contrary to reality ECLAC adds that there has been a decrease in the government’s degree of monopoly over foreign trade and the autonomy of state enterprises has increased. ECLAC acknowledges that in recent years there has been a slowdown in the economic reform process, but attributes it to external factors: deepening of the scarcity of international reserves, damage resulting from hurricanes, and adverse international environment, including the strengthening of the U.S. embargo. To cope with Cuba’s economic problems, ECLAC offers several recommendations: (1) strengthening the productive structure by continuing to rely on “central planning with regard to strategic interests” while “deepening the diversification of property relations [public, cooperative, private], management decentralization, and a more prominent role for the market”; (2) less centralization of decision making and a wider opening to foreign investment that would stimulate capital formation and promote faster economic growth; (3) deepening of agricultural reforms to expand agricultural output, increase substitution for imported food products that represent a heavy burden on the balance of payments, and bring down high food prices; and (4) expansion of fiscal reforms, cutting budget expenditures and external deficits as well as the “repressed” deficits (rationing and excess liquidity), which would require reducing subsidies to agricultural enterprises and promoting exports and import substitution (ECLAC 2004b: 18–19, 22, 25, 28, 52–54, 316). The Cuban government reacted to ECLAC recommendations by implementing more recentralizing measures, expanding expenditures that will increase inflation and the money in circulation, shutting down foreign enterprises, and continuing subsidies to UBPC and state enterprises. Partly as a result of the halting of market-oriented economic reforms, GDP growth in Cuba slowed down from 6.3% in 2000 to 1.5% in 2002 and, according to official data, GDP per capita in 2004 was still 7% below the 1989 level, although the real gap was probably larger. Confronting declining growth rates and a lingering and incomplete recovery, the government has resorted to two statistical manipulations: (1) the new GDP series based on 1997 prices has increased values by an annual average of 56% in 1989–2000 over the previous GDP series in 1981 prices; and (2) the universal methodology of GDP has been replaced by a domestic methodology that adds the value of free social services and price subsidies, increasing GDP by about 2 percentage points in 2003–2004. When adjusted by these two overvaluations, the GDP growth rate of 5% in 2004 is reduced to 1.3%; the projected 9% growth rate for 2005 is technically worthless and not comparable with that of other countries. Various series indicate a systematic declining trend in both gross capital formation and gross domestic investment; the former fell from 25% to 9% in 1989–2003 and was half the regional average in 2003. Stability deteriorated as the fiscal deficit rose from 3.3% of GDP in 2003 to 4.2% in 2004, the deflation rate of 1% in 2003 turned into a 3% inflation rate in 2004, and monetary liquidity (M2) grew by 7.8% in 2004. Increased public expenditures in wages and pensions in 2005 that account for 10.4% of GDP, combined with rising prices in free agricultural markets and TRD, will provoke a growth in the fiscal deficit, monetary liquidity, and inflation. Out of 17 key products, output of 9 decreased in 2004; except for oil, gas, nickel, and cigars, production was significantly lower in 2004 than in 1989. The industrial sector declined by 2%, while the agricultural sector grew only by 1% in 2004, making even less credible the official figure of 5% GDP growth. Sugar output decreased from 2.5 million tons in 2003 to 1.3 million tons in 2004; the latter was 84% lower that the 1989 level and the worst harvest since 1908. Output of oil decreased 2.5%, while production of gas and nickel increased by 7%. The latter, however, was barely above the 2001 level. Production of other key industrial and agricultural goods declined in 2004 (steel, electricity, fertilizers, tobacco, rice, milk, beef, eggs, citrus); previous declining output in fishing and textiles suggest a decrease in 2004 too; only the output of cigars, cement, tubers, vegetables, and beans rose; in 11 out of 20 key products, output in 2003–2004 was 22% to 94% below the 1989 level. The number of tourists and gross revenue from tourism reached records of 2 million and $2.2 billion respectively, the only significantly positive outcomes in an otherwise dismal economy, but contradictory statistics indicate a decline in the occupancy rate and either a decrease or stagnation in the daily average receipts from tourists. Only eight output targets are available for 2005; four of them are either impossible or very difficult to achieve (growth in the industrial and agricultural sectors, sugar, electricity), while another four are manageable and probably will be achieved (gas, number of tourists, nickel, oil). The deficit in the merchandise trade balance surpassed $3 billion in 2004 and was 4% higher than in 2003 and 12% higher than in 1989; such rising deficit, compound by lack of external credit, presents a formidable challenge. Despite the increase in tourism revenue, the balance of trade (goods and services) continued to show a deficit, albeit considerably reduced compared to 2003; the balance in the current account is reported as positive for the first time in several decades, but data are incomplete and the statistical series on foreign remittances, crucial to achieve the purported surplus, has been discontinued after 1999. Terms of trade continued to deteriorate in 2004 and were 56% below the 1989 level. The share of sugar in total exports decreased to 17% in 2003; the shares of fish and seafood, cement, iron and steel, and medicines also declined, and the share of citrus was stagnant, while the shares of minerals and tobacco increased, the former helped by rising world market prices. In 2003 there were rising shares of manufactures, oil, and food in total imports (shares of 24%, 22%, and 20%, respectively), while the shares of machinery/equipment and chemicals decreased (22% and 9%, respectively); these trends confirm the process of de-industrialization and increasing dependency on food imports. The external debt in hard currency increased 9% in 2004, reaching $12 billion; the debt per capita (including the non-convertible debt with former socialist countries) was twice the average of Latin America, while the hard-currency debt was 225% of the value of exports of goods and services, 31% above the regional average. Negotiations with the Paris Club have been broken since 2001, and Cuban default with numerous foreign creditors also continues. Statistics on foreign direct investment have been discontinued since 2001, when foreign investment shrank by 91%. However, the number of foreign enterprises fell 22% in 2002–2004, indicating continued decline in direct investment; furthermore the Cuban government shut down several of the remaining enterprises in 2005. Venezuela (Cuba’s major trade partner) is approaching the role of great subsidizer of the Cuban economy that the USSR played in 1960–2000, by selling oil at 40% of the world market price (a subsidy of $1 billion in 2005), transferring to Cuba hard currency from non-delivered oil that is being sold to third countries, and allowing Cuba to build up a cumulative oil debt of $2.5 billion. China continues to be Cuba’s third trade partner but the agreements signed in 2004 indicate that it will rise to second place. Due to the liberalization in the U.S. embargo, Cuba bought about $1 billion of food products from the United States from the end of 2001 to mid 2005, making the U.S. the island’s 7th largest trade partner. The deals with Venezuela, and to a lesser extent with China, have given confidence to Castro to recentralize economic decision making and de-dollarize the economy, thus reversing the fairly successful but modest market-oriented reforms implemented in 1993–1996, a move also intended to assure the transit of power after his death. The history of Cuban socialism proves, nevertheless, that such cycles of recentralization and movement away from the market have provoked economic recessions and crises. Furthermore although Venezuela’s aid is an injection to the moribund Cuban economy, the even more substantial Soviet aid was unable in three decades to counteract the ill-conceived domestic economic policies. It is predicted, therefore, that economic deterioration will continue despite Venezuelan and Chinese aid. 1. Cuba’s Central Bank (BCC) has not published its annual report since 2001. 2. After 2000, ECLAC discontinued publishing the average rate of GDP growth for the previous 10 years (CEPAL 2003b, 2004c). 3. Pérez Villanueva (2005) shows that prices in agricultural markets decreased in 1995–2000, but rose in 2001–2004. 4. ECLAC (2005) gives as 2005 targets 4.2 million tons and 8.8% increase, apparently confusing the targets with actual performance in 2004. 5. Net factor payments rose in 2003–2004 due to expatriation of profits of foreign companies and rising interest on loans to Cuba (Pérez Villanueva 2005). 6. Cuba’s latest statistical yearbook (Anuario 2003) published incomplete statistics on the balance of payments and only through 2001 (ONE 2004). Hence, ECLAC is the only source for such data in 2002–2004, albeit incomplete also. 7. Entrance into MERCOSUR is impeded by the lack of democracy in Cuba, but in June 2005 it was announced that, to circumvent that obligation, MERCOSUR would sign a bilateral free trade agreement with Cuba. 8. This section is mainly based on Mesa-Lago 2005.